Whether you are working cattle on a farm or competing in a rodeo's team roping event, you need to fine-tune your roping abilities as well as your horse's performance. Improving your practical skills, such as being able to throw your rope accurately, can improve your effectiveness as you and your teammate lasso the horns and back feet of a steer. Practicing with a high-quality, realistic roping dummy helps improve your heading and heeling skills. Roping dummies tend to be more effective for the header, who is in charge of roping the head or horns of the steer. Heelers rope the hind legs, which many dummies do not have. Practicing on live animals is more effective, because you learn how to predict what live animals are going to do and how they will maneuver when you are attempting to rope them. Because heading and heeling require teamwork, you need to practice individually as well as together to make sure that you and your partner can work together effectively. If you need to improve the accuracy of your throws, then try picking up your rope on the right side of the calf or steer that you are trying to rope. Because of the natural swing of the rope, you will end up letting your rope fly to the right side, and the momentum and angle will be more effective if your rope started out on the correct side rather than while trying to cross over. Remember that the pickup begins when you actually start swinging your rope in preparation to throw it. Start with a quality, sound horse who is naturally talented at his job. 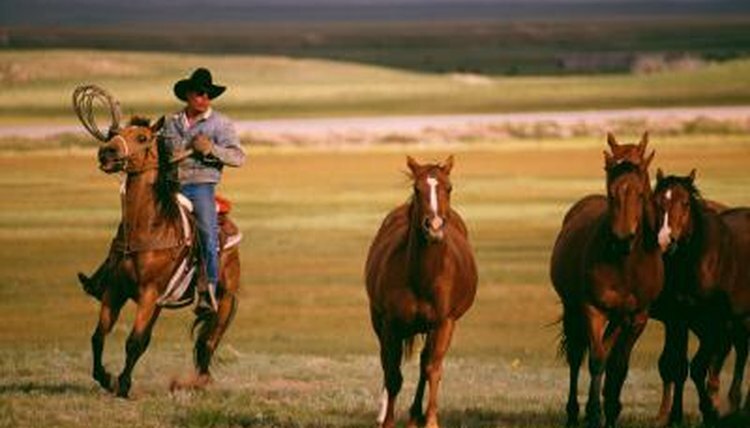 Horses that are bred for cutting and working cattle tend to make the most effective roping horses. A smart, sane horse with powerful hindquarters and a quick take off will naturally be more efficient coming out of the chute. Try to avoid horses who get so excited that they can not focus on the task at hand or who work themselves into a lather before you ever make it out of the chute. Once you have found a good candidate for your roping or heeling horse, take your time having him professionally trained to do his job. Do not attempt to take short cuts in his training. Your horse will need a solid foundation of basic skills and commands in order to perform at his highest potential. You cannot simply just toss the rope in the steer's direction and hope it hits the right spot on him. You need to work at determining how much force you need in your throw to cover the distance between yourself and your horse and the animal you are trying to rope. Practice gauging the distance and accuracy of your throws as well as timing yourself to improve your overall performance. The better understanding you have of your own skills, the more effective you will be in using them to accomplish your goal.